Series: Lunar Chronicles, Book 3.5? I adore these retellings, though this one was a lot shorter and maybe not quite as complete a story as I would have liked. I guess it's more like a novella. It doesn't actually retell the whole Snow White story (as I assume Winter will be more along those lines), but the story behind the evil queen of that tale. 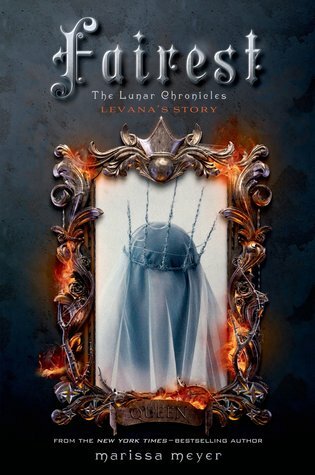 I felt very sorry for Levana throughout the book, and I found myself very sad at the choices she made. I listened to this on audio, and I thought the narrator, Rebecca Soler, was good but not great. I also own a hard copy, cause I'm like that. I am excited to get to the next book (only a few weeks)! Too short :). I found the narrator's voice was really great at young girls tones, but her male voices were...not good. It sounded like a teenage girl's diary read aloud. Which, I guess it kind of was. I want to hurry and read this one before Winter comes out. I don't have high expectations for it though. Yeah, I'm hoping Winter will be amazing again. I've had this one for a while (since the super fun Melissa Meyer event at Changing Hands in Tempe! ), but I still haven't read it. I'll probably do it right before I read WINTER. Can't wait!